IVAN GUNDULICH (1588-1638), known also as Giovanni Gondola, Servian poet, was born at Ragusa on the 8th of January 1588. His father, Franco Gundulich, once the Ragusan envoy to Constantinople and councillor of the republic, gave him an excellent education. He studied the "humanities" with the Jesuit, Father Muzzi, and philosophy with Father Ricasoli. After that he studied Roman law and jurisprudence in general. He was member of the Lower Council and once served as the chief magistrate of the republic. He died on the 8th of December 1638. 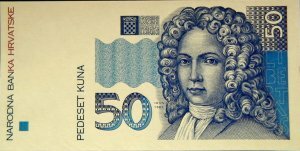 Servian poet on Croatian national currency "kuna"